Texture & Appearance: – This is a smooth textured sauce with a nice reddish brown color and creamy consistency. There are discernable bits of what appears to be coarse ground black pepper that I can feel on my tongue when I taste the sauce. As you can see from the picture, the smooth consistency and texture coated the chicken wings very well, preventing a lot of wasted sauce. If I may draw a comparison to their original BBQ sauce, I’ve used it on everything from burgers to sausage, Soy Boca Burgers, and even rice, and the thick, but not too thick texture easily works with many foods. Please don’t judge me for the Boca Burgers – a guys gotta manage his cholesterol some way – just saying. Taste Straight Up: – This sauce shined in the taste category. For this review, I used it on plain chicken wings that I picked up from a wing chain well known for its large flying animal logo, and I also tasted spoonfuls of sauce at various temps: right out of the frig, room temp, and slightly warmed. Each of the three scenarios brings a little different experience to the tongue. At room temp, the first flavor I tasted was a nice pop of black pepper embedded in a tangy sauce with a hint of smokiness and sweetness. This was quickly followed by the spicy zing of the mustard and cider vinegar and, coming a little later to the party, the back end “citrusy” goodness of habanero. I really couldn’t tell that ketchup is the main ingredient, and outside of the obvious influence from the black pepper, I was impressed that none of the other spices including garlic and onion, dominated my palate. Heat Level: – The heat is 2 fold: you get a quick, mild black pepper/mustard/vinegar spice zing when first tasting, quickly followed by a back end, building habanero heat that is on the medium heat scale. The heat, after building initially, quickly subsides, but the spicy zing from the mustard, cider vinegar, and black pepper hangs around a little while, creating a party in your mouth. After all, it is from Louisiana, and Louisianans love a party. 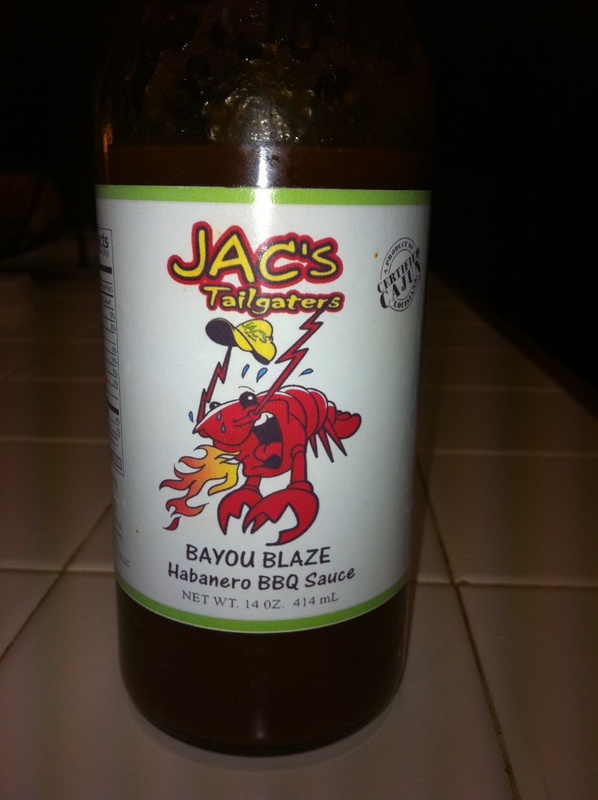 Label/Graphics: – All of Jac’s products have their signature cartoon hat-wearing crawfish on the label. I like the crawfish, and it’s a good match for Louisiana, since they tout their “Certified Cajun” status for their entire product line. The crawfish is depicted a little differently for each product label, and is shooting flames out of his mouth for this sauce. I wonder if a bolder, less busy looking icon would be cleaner and better recognized on a supermarket shelf, but I like the logo and appreciate their desire to focus on their Louisiana roots. Making the “Jac’s Tailgaters” wording in a larger, bolder manner may also be something to think about, when thinking about commercial store placement. But the label is distinct and does a decent job at building brand recognition and consistency. Overall Impression: – I rate this sauce a solid 4 stars overall. It is a great, all purpose BBQ sauce for someone who likes some heat, but not crazy hot BBQ heat. 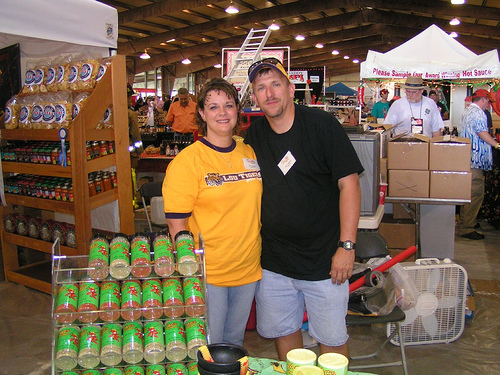 I like the different types of discernable heat on the front and back ends, and Tracy and Kristi have done a great job providing a wonderful variety of spice, heat, and flavor with their Bayou Blaze Habanero BBQ Sauce. As I mentioned, their Original BBQ Sauce is basically the same flavor blend in a milder sauce, so if you’re like Brian and don’t normally care for heat in your BBQ sauce, then there are good options without sacrificing taste and quality. Jac’s Tailgaters is a great little company putting out quality products, and this sauce made my chicken wings, and my belly, smile big and long! Great review, Ken did a fine job, a nice addition to you site Brian! I am totally embarrassed! It is Tracy and Kristi Carter, not Cook. I knew their last name and just had a total brain drain moment. My apologies to the Carters, and to HotSauceDaily.com for the oversight. I’ll proofread my work more carefully in the future. It is just my wife is prettier to look at so he focused in on her name kristi cook carter. 🙂 But really my dad always said your name is JAC’s Tailgaters now boy!!!! Guys this was truly a great review. Ken has a great quality about him that really makes me want to read more. 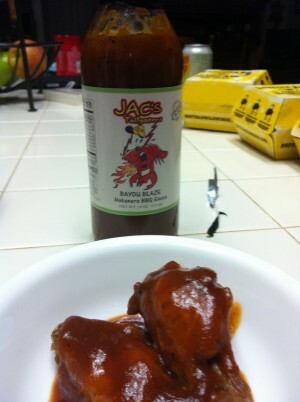 Brian thank you so much for posting it on your site really means a lot to us here at JAC’s. Looks good, nice and saucy on the wings. I do like the fruity component that habs bring on the back end. Ken i really liked your review. The straight up taste at 3 different temperatures was very good and informative of what to expect. The heat level section was also very nice. Really as good review befitting of hot sauce weekly/ daily/minute. 🙂 even was comparable but with a different style to the king of hot sauce (in my mind any way) Mr. Scott Roberts. I follow them both every week. I do not post much as far as comments and apologize to both HSW and Mr. Roberts for that inconsideration. I realized after being told by Marilyn to make a comment. That it is a great satisfaction for people taking the time to do these great blogs and reviews to just get simple feed back, how that kind of makes it all worth while. If you do your own blogging Ken please provide a link so that i may follow you as i do HSW and Mr. Scott Roberts.